It's Chelsea: September Beauty Favourites! As we step into October, it truly is Autumn now. Not going to lie, my thick wooly scarf and winter coat did make an appearance last week! Although I've been sporting a "no make-up" make-up look these days, I feel that when the weather gets colder, it's more acceptable to wear more make-up i.e. bolder lip colours, more mascara and more eyeshadow. Obviously I don't cake on as much makeup as humanly possible. Here are the products that I've been LOVING this September. I've written a full review of this previously on my blog so I won't bang on about it too much but this just transforms your whole makeup look. It's a bold lip that you won't budge if you do the whole apply one layer and then dab and then apply another layer (you know the drill...). It stays put for the whole day even after I'd had several drinks but not food, but come on, no lip product would be able to survive that, let's be realistic here. Please give this a go! I've never really been too bothered about my eyebrows, until I picked up this up from Etude House. It's just a double ended eyeshadow dark brown pencil. I usually brush through the hairs quickly before applying the pencil gently in small strokes. It's a twist up pencil which makes it so much easier because you don't have to faff about with finding a sharpener. I then brush through my brows again to make it look more natural. This translucent powder transforms your whole skin texture and makes it looks so much smoother and flawless... Do I need to say anymore?! I apply this after applying BareMinerals foundation powder and the finishing powder makes my foundation last the whole day. I've had this pressed powder for a while now and I used to love it but then somehow forgot about it while I was busy trying out new products. I rediscovered it while tidying my makeup collection and I couldn't be happier! This shade is obviously a lot darker than my natural skin tone but I use it more like a bronzer and apply it mainly to my cheeks and then lightly over my whole face (I can get slightly carried away when applying this!) It gives you such a nice glow and I definitely need it when my skin gets duller in the colder months! I can't remember which blog made me want to instantly buy this from eBay, but it's definitely one of the best things I've bought from eBay by far. I've used it every day in September and because there are 10 colours to choose from, it's so versatile. There's 3 matte shades and the rest are slightly shimmery, but nothing that isn't wearable during the day. For £3, the blushes last very well and aren't too powdery. What have you been loving? Nice collection, love Etude House. They do a very good eye primer which I've been using recently. 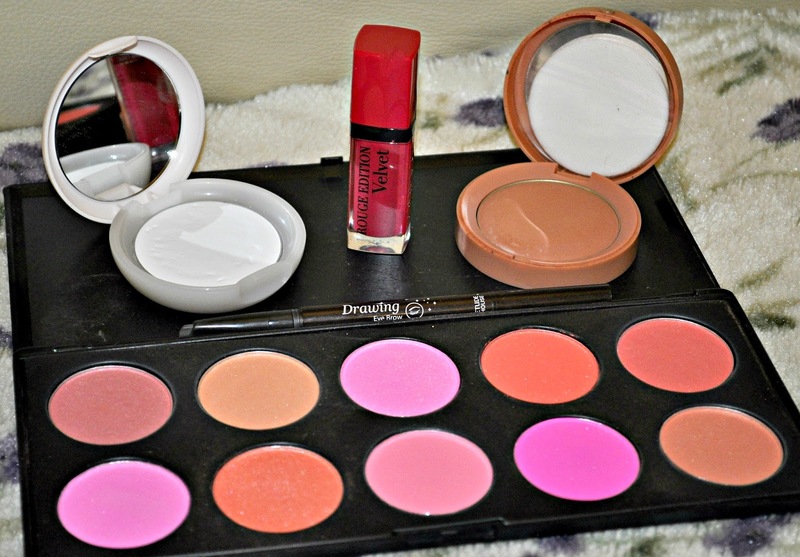 I love that blush palette! The colors are gorgeous!